One of the ways The Experiential School and Lower School honor Martin Luther King, Jr. is by performing acts of service for each other in January. Each class randomly picked the name of another and decided a way to perform a kindness towards that class. 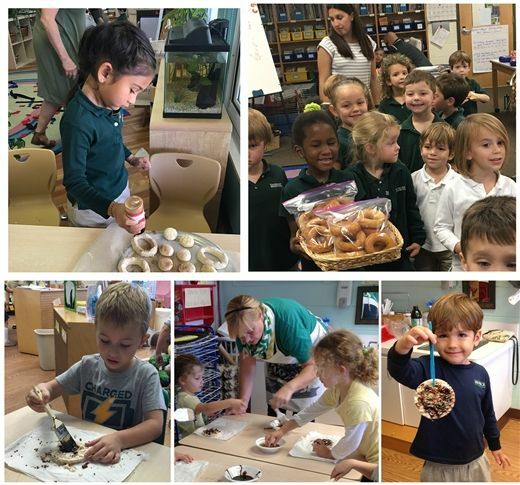 During the past week, two of the Junior Kindergarten classes decided to treat their special friends to doughnuts they made themselves. Ms. Jotch’s class delivered treats to Mrs. Boarman’s fourth grade class, while Mrs. Craver’s class took a delicious snack to Mrs. Whitecage’s first grade - where they had the additional treat of hearing a story together. Acts of kindness aren’t limited to doing nice things for people, they can be focused on our natural world as well. To help the many birds that delight us with their song and beauty, the Alpha students created bird feeders from rice cakes, molasses and bird seed. Creating these feeders required utensil control for brushing on the molasses and fine motor control for sprinkling on the seeds. They are now hanging on the playground fence, ready for the birds to eat their fill during these months when food in the wild may be scarce. Read about Shorecrest in the MLK Dream Big Parade here. For more from this week in The Experiential School, read Betty's Blog.